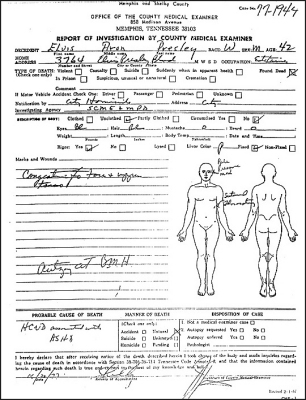 Elvis Presley’s autopsy commissioned after his death involved draining all body fluids, removal of all vital organs, and sent to a pathology lab for testing to ascertain the cause of death. The coroner, Dr Jerry Francisco, who with Dr Eric Muirhead and Dr Noel Florredo attended the autopsy on Presley… they initially concealed the facts by attributing the cause of death to a massive heart attack. Back to Giorgio’s ‘weight mystery’ – one does need to be a math genius to figure-out, if you remove most of a persons guts they will end-up a lot thinner! 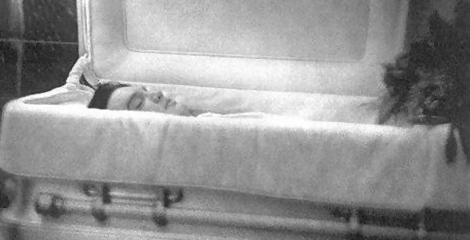 Yet, contrary to all the facts, Giorgio relentlessly tries to provide even more clues to Elvis’ mysterious death – by questioning the secret cover-up of the autopsy report. The fact is,Vernon upon receiving evidence that a mixture of addictive-drugs was indeed the cause of his beloved son’s death, panic and quickly paid off officials to keep the document a secret. Dee Presley, who became Elvis’ stepmother by marrying Vernon in 1960 states that she sighted the autopsy papers and agreed with her husband to support the ‘over dose’ cover-up. Giorgio’s most outrageous revelation is not the written word – but voice of Elvis (on tape) reiterating and confirming all her claims! To this day, Giorgio adamantly states the interview took place well after Elvis’ death but has refused any further details! In part, the interview has Elvis explaining, his life of anonymity not being easy, because he has had to grow a beard to disguise himself. The question that immediately springs to mind – is why Elvis would seek-out Gail Brewer Giorgio (who he never met alive or dead) over-n-above his family and friends to disclose his hoaxed disappearance? Anyway, in 1985 David Darlock, an Elvis impersonator threw a spanner into the works on television. On the GERALDO talkback show, Darlock admitted he was paid $250 in April 1981 by the Elvis fan club, “Eternally Elvis” to simulate the voice of Elvis for an album. He also, produced the signed contract of this deal!